Each year National Mustang Day reaches more and more Mustang enthusiasts and is even getting noticed by the media. We found various articles from USA Today to on-line sites discussing the program and how, on April 17th, Mustangs are on the road honoring the iconic Muscle Car. The 2018 National Mustang Day attracted thousands of clubs and individuals from all over the world, including Africa, Australia, Europe and the Middle East. The concept of making April 17th, National Mustang Day is continuing to grow. CLICK HERE TO VIEW 2018 PHOTOS. The 2019 National Mustang Day decal program will continue as a fund raiser for the Mustang Owner’s Museum, with clubs and individuals asked to purchase the 2019 NMD decal for $1.00 each. We realize a few clubs mistakenly just signed up for National Mustang Day, but did not order the decals for their club or individual. On the sign-up form, it is now noted that clubs/individuals will need to order the decals in advance. We hope you will again be part of the largest one day community Mustang event in 2019. In late 2015, we introduced the idea of the Mustang World coming together on April 17th and driving their Mustang. Thus National Mustang Day was born. The idea is to let the world know April 17th is owned by the Mustangs. We expected 7,000 to 8,000 Mustang enthusiasts to sign up for the free window decal and create a Mustang activity with their Club that we could share on the National Mustang Day website. ​Well, we grossly underestimated that number!!! We received close to 15,000 signups for National Mustang Day. Our goal is for you to sign up as soon as possible to allow us to list the clubs/groups/individuals participating on the National Mustang Day website, along with details of their planned activities. We look forward to making the 2019 National Mustang Day an even larger event, by putting more Mustangs on the road. 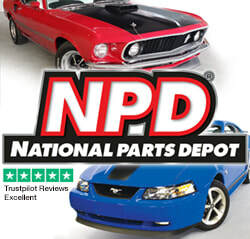 Time to let us know your National Mustang Day plans!